You probably heard about the concept of time relativity. Whether you are already familiar with the concept of time dilation or just take your first steps in the field of special relativity, this time dilation calculator will help you to get a better understanding of relativistic effects and of the time dilation equation. Time dilation principle states that time isn't perceived in the exact same way by everyone. If you move at a very high speed, time begins to slow down. Obviously, you don't get to move in slow motion - from your perspective, it passes as usually. Instead, you can observe that time passes much slower for all objects you move relative to. A famous thought experiment of twin astronauts is a good example that makes time dilation easier to understand. Imagine that one of the twins stays at home on Earth, and the other one gets on a high-speed rocket. He spends some time traveling through space and returns home after what he thought was a few years. To his surprise, he finds that his twin has aged much more and is now an elderly man. 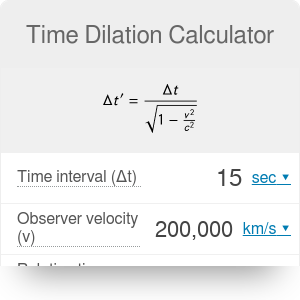 You can probably see (or have already discovered it while playing with our time dilation calculator) that in order for the difference in two time intervals to be noticeable, the observer speed must be extremely high - of the same order of magnitude as the speed of light. That's why relativistic effects are so counterintuitive: we are unable to experience them in everyday life. Of course, these effect are real and measurable. Clocks on satellites run slightly faster than the ones on the surface of Earth (see the escape velocity calculator for more information on their speed). Once we will be able to travel at a speed really close to the speed of light - for example, at 0.8c - we will also observe more dramatic relativistic effect. Time Dilation Calculator can be embedded on your website to enrich the content you wrote and make it easier for your visitors to understand your message.